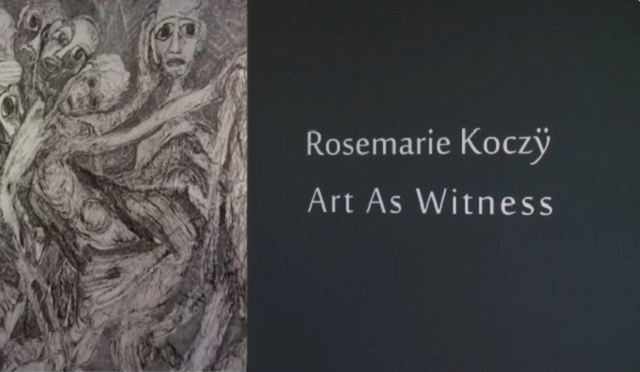 This video of artwork exhibited at QCC CUNY, done by the artist Rosemarie Koczy, a holocaust survivor who was taken to Traunstein (Dachau) at the age of three, depicts her intimate heart-wrenching response to her experience…the holocaust also the subject of documentary photography. Her husband, Louis Pelosi composed the music as a memorial. Preserving and disseminating these documents are supremely important as there are those who would claim, to further their own agenda, that these things never occurred or were not as is claimed. I believe as a people we need to know our true history, and must do all we can as citizens of the world to keep the record as accurate a reflection of our behavior as a people as possible. This entry was posted in Video and tagged Rosemarie Koczy, video by jmresnick. Bookmark the permalink.